Dallying In The Dirt, Issue #208---Strawberries from seed have finally been successful. On the first weekend in March I stare out my windows vainly searching for any sign of spring. There is a at least 30cm of snow covering the location of my earliest blooming Snowdrops. They will and usually do, bloom at the leading edge of the receding snow. 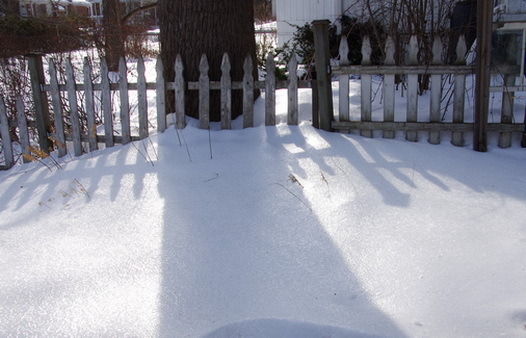 There is no edge because the snow shows no signs of receding. The weather man says it may make +6 C by the end of the week; we will wait expectantly. If I just train my eyes and my mind to enjoy what we have instead of hoping for something different, I can see a backyard that is covered in brilliant blazing crystals. We had a bit of freezing rain last week and it put a crisp glossy coat on the snow that just jumps and dazzles when the sun shines on it. It also makes wonderful light and dark shadow patterns as the setting sun outlines the trees and shrubs and casts that outline across the hard sparkling surface of the snow. The visiting dog does not appreciate this beauty. She can walk about 3 - 4 steps on the surface of that snow and then breaks through and struggles to get back to the surface. I should rush out and rescue her but she needs the exercise and the amusement factor is too great. Oops, I hope her owners aren’t reading this on whatever tropical island they are relaxing. I can turn away from that crystal landscape and look into the kitchen and enjoy the fruits of my winter gardening labours. 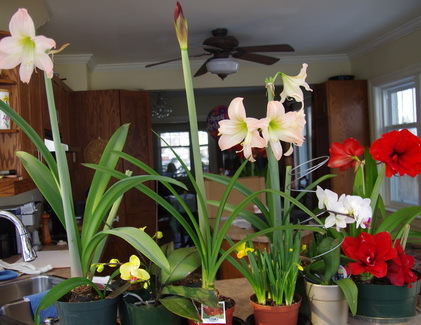 Orchids are blooming in a variety of colours, the last of the Amaryllis are showing off their huge colourful flowers and underneath them the first pots of forced Narcissus are showing off their bright yellow flowers, that have a real promise of spring in them. The Assistant Gardener is in a quandary. This mass of blooms is taking up a sizable piece of the kitchen counter, which is a bit of a messy pain but how can she complain about such colourful delights. The Thanksgiving Cactus lives on shelf over the fridge when it has finished blooming. It is doing a strange and wonderful thing. It is totally covered in bloom this week for a second time this year. In theory it blooms in late fall under the influence of the shortening days, so now that the days are getting longer why has it started to bloom again. It’s gorgeous so I’m not complaining but once again Mother Nature has be bewildered. Success is finally mine. I told you that I had purchased some of the new hybrid Strawberry seeds for the third year. Apparently I have provided the correct temperature and whatever else they need because there is a little strawberry seedling in each of the cells. I’m hoping that they will flourish and go outside in the spring to fill our cereal bowls by late summer. Even here, though, Mother Nature confounds me. I bought two packages of seed of two different hybrid varieties. 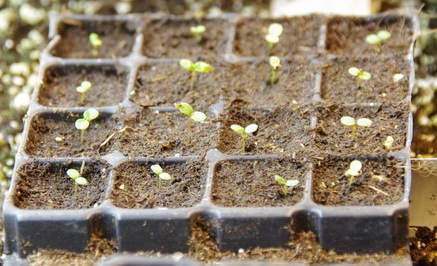 They are sitting side by side, in exactly the same conditions in the germinating bed. One has appeared out of the soil close to two weeks earlier than the other one. Why?? Since they are all growing, I’m going to stop asking why and just revel in my success. The seed catalogue describes them as challenging and up until this year that was an understatement. I don’t like to lose to a package of seeds. All of my readers must be hibernating. For the first time in a few years I have no questions to answer. It would be delusional to think that I have already provided all the answers because in gardening that just isn’t possible. I’m sure there will many more to come and I look forward to helping contribute to your gardening success by providing answers where I can.